Wellness, and how the home can help you achieve it, is becoming increasingly important to both the people building houses and those who will ultimately live there. If you’re ready to jump on this trend and use your favorite technology to improve your daily health habits, we have some ideas for you. A good night’s sleep is paramount to health. You’ll be in a better mood, more productive at work, more motivated to work out or play with the kids and have a better chance of losing or keeping off weight. So how can a smart home help you catch some ZZZs? Circadian lighting simulates the type of natural light you encounter at different parts of the day and has a huge impact on how well you sleep. Adding circadian lighting to your home can be as basic as installing a lightbulb or as high tech as choosing a system that changes the light’s color on a timer. There are also alarm clocks that gently wake you as opposed to startling you out of slumber, something that almost always gets you up on the wrong side of the bed. And don’t forget the kiddos. Make bedtime easier on everyone with a combination alarm clock/night light/sound machine. More and more kitchen appliances are getting smart. The refrigerator might have been one of the first to transition, but now Amazon has a smart microwave and several companies have introduced smart ovens that can tell you when the roast is done. Some of these items can still be a bit pricey, but that doesn’t mean you can’t still be smart in the kitchen. Use your Amazon Echo or Google Home, for example, to help you be a better chef. Who can remember what the internal cooking temperature should be for your meat? You don’t have to when you can say, “Alexa, what temperature should my chicken cook to?” And if your goal is to be better at meal prep and planning, use these assistants to help find healthy recipes, create your grocery list or even order your groceries for you when you’re synched to the appropriate services. Sanity is a kind of healthy, and with today’s schedules getting increasingly hectic, sometimes not having to think about “just one more thing” can make you feel a whole lot better. With a smart lock like the Schlage Encode™ Smart WiFi Deadbolt or Schlage Sense™ Smart Deadbolt, you’ll never have to wonder if you remembered to lock your door before you left the house. Simply check the lock’s status on your smartphone or ask Alexa from the other room. Other features can go a long way toward that peace of mind as well. The activity log in the Schlage Home app can tell you when an access code has been used, so you’ll know if your kids arrived home safely from school. You might even want to check on the locks at your elderly parents’ home if they often forget to secure their front door. Maybe your worry is more about deliveries to your home. Keep porch pirates at bay when you pair your Schlage Encode lock with Key by Amazon. Prime users in select areas can opt in to having packages delivered inside the front door, protecting your newly purchased items from would-be thieves, Mother Nature and more. No matter how many air purifiers we have or plants we grow, there are always things – pollen, carbon monoxide – in the air. Some of them good, some of them bad, some of them both or neither depending on how much of it there is. Your smart home can help you determine your air quality and take steps for improvement. There are the more obvious smoke and carbon monoxide detectors that can literally keep you alive. Forbes also talks about how some homes are also being built with sensors that, when high levels of allergens are detected, will adjust your air filtration system to literally clear the air. When you integrate smart technology into your home, you not only do your part for the environment, but you can also improve your health and that of your family as well. Visit Schlage.com for more tips and trends in smart home automation. There's no denying that the right smart lock can make your day-to-day much more convenient. Having the freedom to come and go without worrying about getting locked out is a major relief for many families, and ditching the fear that someone may lose or steal a spare key cannot be replaced. But do you still have concerns keeping you from taking the plunge and embracing a keyless lifestyle? Here are nine common smart lock myths you can ignore. "Smart locks are too technical." When it comes to new technology, many homeowners simply leave it to the early adopters to figure it out and avoid installing something new for fear of it being too technical. At Schlage, we've worked hard to simplify every stage of the smart lock experience. With the aid of the installation guide or our easy step-by-step video tutorials, you can install your lock in just a few minutes and the only tool you'll need is a screwdriver. It’s also never been easier to set up your Schlage lock with other home automation devices and build a true smart home. "The lock will fail when the power goes out." All Schlage's smart locks run on battery power. That means when the lights go out, your lock will continue to function as normal. Each of our keypads and touchscreens features back-lit numbers so you'll never be left fumbling in the dark to unlock your door. If the power does go out and your lock loses its connection to your home network, you won’t be able to access your lock remotely. However, you can still lock and unlock your door at the keypad. There’s no need to give up peace of mind just because the power is down. "The lock must be wired"
Because our locks are powered by batteries, there's no wiring involved. Simply snap the lock in place while following the installation instructions and install the batteries. You'll be up and running in no time. Each lock is also equipped with a low battery warning and backup entry method in the unlikely event that your batteries do fail. We recommend changing your batteries regularly as a best practice. For more information on which battery is best for your smart lock, check out this resource. "A new smart lock won't work with my technology." Schlage offers a variety of smart locks, each working with a different kind of network – WiFi, Bluetooth, Z-Wave Plus and Zigbee. They’re also each compatible with a variety of smart home partners, including Apple HomeKit, Google Home, Samsung SmartThings and others. If you’re looking to connect to voice-control assistants or link to your Amazon account, we can do that, too. Use our Get Help Deciding tool to learn more about which Schlage smart lock works with the technology you already have in your home. "Smart locks are a bulky eye-sore." There's no reason to sacrifice great style for greater security and convenience. Our smart locks are available in the industry's most stylish finishes and trims. They feature a slim profile and tasteful design that creates a stylish look that effortlessly pairs well with our interior door hardware offerings. "The numbers will wear down and someone can guess my code." Each of Schlage's smart locks feature a fingerprint-resistant touchscreen that works in the rain and when you’re wearing gloves. The numbers are guaranteed not to wear down or fade, so you can rest easy that potential intruders will not know your unique access code. "Mechanical locks are more secure." An important step any time you choose a new deadbolt to secure your home - whether mechanical or electronic - is to research the security grade of that deadbolt. A security rating of AAA is- the highest on the market, meaning top marks in Security, Durability and Finish. Schlage’s smart locks - the Schlage Encode™ Smart WiFi Deadbolt, Schlage Sense™ Smart Deadbolt and Schlage Connect™ Smart Deadbolt with alarm - have AAA ratings so you know you've purchased the most secure lock on the market. "A key is more reliable." How many times have you lost your house key? Or walked out the door without it, swinging a locked door closed only to realize you cannot get back inside? With electronic locks, you no longer have to worry about that. Coming and going is easy when you're not weighed down by keys. But if you like to have that backup key - just in case - each of our smart locks provide that option for additional peace of mind. "It's too early to invest in a smart lock." If security weren’t a concern of yours, you wouldn’t be considering a smart lock. Schlage takes protecting you and your home seriously. The same commitment to quality and safety that we’ve put into mechanical locks for more than 95 years also goes into every smart lock we produce today. When you choose to trust Schlage, you get a limited lifetime mechanical warranty and a three-year electronics warranty, so you know we stand behind our smart locks. Learn more about each of our smart locks at Schlage.com and start building the smart home of your dreams. If you have questions about Key and how you can use it to help make your home more secure and convenient, we have the answers. It seems like Amazon does just about everything these days – simplifies gift giving, delivers groceries and even tells you cat jokes when you ask Alexa. Now Amazon locks your door and makes accepting packages even easier thanks to Key by Amazon’s compatibility with smart locks. If you have questions about Key and how you can use it to help make your home more secure and convenient, we have the answers. What is Key by Amazon and how does it work? Key by Amazon is a smart home solution that can pair a compatible smart lock, Cloud Cam (Key Edition), the Key App and your wireless network to help you control access to your home from anywhere. In addition to keyless entry, when you pair your smart lock with the Cloud Cam, you can watch video clips when someone enters or exits your house, manage access codes and check on the status of your lock and its battery through the Key App. Prime members in select locations can also opt in to in-home delivery, offering additional convenience and peace of mind knowing that your packages won’t be stolen from your porch. Where is Key by Amazon available? The home-delivery option through Key by Amazon is available only in select cities and their surrounding areas. You can check the availability at Amazon.com or find a list of participating areas. Additional features of the Key App, such as the ability to set up and control your compatible smart lock remotely or manage guest access are available to anyone with the app and is not limited by location. You can also still use the Amazon Key App and the Amazon Cloud Cam for visually monitoring your door, even if you aren’t using in-home delivery. Keep an eye on your kids coming and going, or get video confirmation of the dog walker entering your home. Is Key by Amazon safe? When using the in-home delivery option, there is no need to provide access codes to those delivering a package. You will receive notifications of their arrival, can watch live video of the delivery through the app and receive additional notifications that your door has been re-locked. Compatible Schlage smart locks also offer auto-lock functionality that can be managed in the Key App for added assurance. Learn more how home delivery works here. Key is not currently integrated with home security systems. Because you will need to disable your system on delivery days, Amazon suggests not using the in-home delivery option if you are not comfortable turning off your system. You can also choose to use voice control commands through Alexa to unlock your door. As an additional level of security, you will be required to set and use a four-digit code to unlock your door using voice control. Do I have to use the in-home delivery option? Can it be disabled whenever I want? You are not required to use in-home delivery to enjoy the other benefits of Key or your smart lock. You can still control your lock remotely, watch videos of loved ones and trusted friends enter and exit your home via the app, assign access codes and more. If you enable in-home delivery, you can still block access on specific days via the Key App. Delivery drivers will simply leave your package on the porch as usual. Can I use Key by Amazon for other service providers too? Your smart lock can be used to grant access to other service providers such as house cleaners or dog walkers because of the ability to lock and unlock your door from anywhere and assign unique access codes. Access codes can be scheduled for one-time or recurring use, such as for the house cleaner every Wednesday at 9 a.m., as well as on a permanent basis. You can activate or deactivate, as well as change or delete, codes at any time. Which smart locks work with Key by Amazon? The new Schlage Encode™ Smart WiFi Deadbolt and Schlage Connect™ Smart Deadbolt with Zigbee certification are both compatible with Key by Amazon. Do I need additional accessories to use Key by Amazon? To use all of Key’s features, you will need the Amazon Key Smart Lock Kit. This includes a compatible smart lock, the Cloud Cam (Key Edition), which serves as the smart hub that allows your Zigbee-certified devices to communicate with your wireless network, and the Amazon Key App. You can purchase the kit as a bundle at Amazon.com. With its built in WiFi, the Schlage Encode Smart WiFi Deadbolt communicates directly with your wireless network, so you can still control your lock remotely, manage codes or check the status of your lock, even without the Cloud Cam. However, you will need the Cloud Cam to enable in-home delivery or use the video monitoring features. Does Key by Amazon work with Alexa? Learn more about synching Key with an Alexa device here. How do I set up my lock with Key by Amazon? Download the Amazon Key App to your smartphone and log into your Amazon account. Select the setup option in the app and follow the steps provided to synch your smart lock and the Amazon Cloud Cam if it is required for your lock model. You can then use the app to manage access, enable the in-home delivery option and more. Amazon provides troubleshooting tips if you have questions about pairing your lock. If I enroll my Schlage lock with Key by Amazon, will my lock still be compatible with other smart home devices? A compatible smart lock synched to Key by Amazon can only be managed with the Amazon Key App. Attempting to use multiple apps to control your smart lock may result in your lock or the apps not working as intended. Security continues to be a primary reason homeowners invest in smart home technology. That’s why Schlage provides a wide range of smart locks. See for yourself the world of possibilities that lets you make the most of today’s rapidly growing smart home technologies. Visit schlage.com to learn more about Schlage's smart lock portfolio. Schlage’s reputation for innovation continues with the introduction of our first smart lock that connects directly to your home’s WiFi network. Schlage’s reputation for innovation continues with the introduction of our first smart lock that connects directly to your home’s WiFi network. The Schlage Encode™ Smart WiFi Deadbolt is the ideal smart lock for homes that want a secure and stylish option that is also simple to use. By eliminating the need for external adapters or costly subscriptions, the Schlage Encode WiFi Deadbolt offers the features that matter most to homeowners, including smartphone control through the Schlage Home app or Key by Amazon app, advanced encrypted security, up to 100 unique access codes and a variety of designs and finishes to complement your décor. The Schlage Home app supports the Schlage Encode WiFi Deadbolt, meaning that even if you choose to use the Key by Amazon app, you still will receive free firmware updates to your lock. That means you won’t have to replace the deadbolt to take advantage of the newest features. You can also lock or unlock your door, manage and schedule access codes, and customize notifications – all the features you expect from a Schlage smart home solution. The Schlage Encode WiFi Deadbolt also works with leading smart home technologies, including Key by Amazon. When paired with the Amazon Cloud Cam (Key edition), Prime members in select cities and surrounding areas can opt-in to in-home delivery. Amazon delivers your package right inside your doorway, and Amazon locks up on the way out. And for extra peace of mind, the smart home solution offers visual verifications so you can watch video clips of who enters and exits your home through the Key by Amazon app. When connected to a compatible device, users can control the Schlage Encode Smart WiFi Deadbolt ¬with their voices. Convenience and peace of mind from anywhere are just a voice command away. Ask Alexa to lock or unlock your door with Key by Amazon when you enable the Alexa skill. You can also check the status of your lock, so there’s no wondering whether you locked up when you left the house. Google Assistant users can also check the status of their Schlage Encode Smart WiFi Deadbolt, as well as say, “Hey Google, lock my door,” when it’s paired with the Schlage Home app. Security continues to be a primary reason homeowners invest in smart home technology. That’s why Schlage provides a wide range of smart locks. See for yourself the world of possibilities that lets you make the most of today’s rapidly growing home automation technologies. Join the millions of satisfied homeowners who trust the safety, simplicity and style of Schlage, and find out where to buy your Schlage Encode Smart WiFi Deadbolt at schlage.com. Smart locks: Keyless entry for the front door and more. The ease of keyless entry and the ability to access, monitor and control your home’s security using a smartphone makes today’s smart locks an ideal choice for both security and convenience. The ease of keyless entry and the ability to access, monitor and control your home’s security using a smartphone makes today’s smart locks an ideal choice for both security and convenience. No more fumbling for keys to lock and unlock the doors of your home and no more rushing back to let in a trusted service provider. The Schlage Sense™ Smart Deadbolt and Schlage Connect™ Smart Deadbolt, as well as the new Schlage Encode™ Smart WiFi Deadbolt and Schlage connected keypads, allow you to control your lock from anywhere using your phone or even your voice with a wide variety of voice assistant devices. Regardless of your system and the technology powering it, smart lock technology can open many doors for you and your family. Secure the outside access door of your garage or even the pass-through door from your garage to your home. Arms full of groceries? No problem. Unlock your door before you even get out of your car. Is your garage door closed and you need to get in to put the mower away? The same phone you were using to listen to tunes while you mowed the lawn can now be used to unlock the garage door for quick and easy access. Do you prefer to have the kids come in through the back door and leave their wet boots and outerwear in the mud room? Let them in remotely, set a schedule for the door to be unlocked when they get home from school or give them their own customizable security codes. Again, it’s the picture of convenience. You don’t have to worry about them losing or forgetting their keys and you can monitor them coming and going on your phone. Are you at work on a busy Monday morning and find yourself wondering if you locked the door to the patio after Sunday’s barbecue with the neighbors? Talk about needing peace of mind. With select smart locks, you can check the status of your door locks using your phone. Confirm who last unlocked the door and lock it again for good measure, all from anywhere you happen to be: the office, the gym, the grocery store, wherever. Of course you want your front door to be secure. With a Schlage smart lock, you’re covered. You can schedule, manage and monitor entry for a friend or neighbor to bring in your mail while you’re on vacation. You can grant scheduled access for anyone from visiting relatives to cleaning staff. And, in select service areas, you can use the Key app by Amazon and a compatible cloud-based camera to grant and monitor access for home deliveries. Do you have a tool shed in the backyard? A stand-alone garage, carriage house or pool house? What about a dedicated entrance to a home office? These are all ideal locations for a smart lock. You’re only limited by your imagination and your need for security. Schlage’s customers have even put a Schlage connected keypad lock on their wine closets! The sky really is the limit. Explore a world of possibilities at Schlage.com and purchase from your favorite retailer or online at amazon.com, build.com, lowes.com or thehomedepot.com. And enjoy the safety, simplicity and style of Schlage. Get help selecting the Schlage smart lock that’s right for you here, and enjoy the safety, simplicity and style of Schlage smart locks throughout your home. Schlage and Ring. Making smart home security even smarter. If you’re looking to make your home more secure affordably and conveniently, we have good news for you. If you’re looking to make your home more secure affordably and conveniently, we have good news for you. Schlage, together with the home security innovators at Ring, is giving you the ability to monitor your home 24/7 from just about anywhere using your smartphone. Say hello to a new wave of DIY smart home security. Schlage and Ring are leading the way with cross-compatible technologies that work together seamlessly to address home security challenges. The Ring Alarm Base Station operates on a Z-Wave mesh network. That means that the Z-Wave-certified Schlage Connect™ Smart Deadbolt and the Ring Alarm work on a single, integrated network, simplifying the process of making smart homes more secure and convenient. How can synching Ring Alarm with your Z-Wave enabled, Schlage Connect™ Smart Deadbolt add convenience and security to your life? After pairing the devices, you can lock and unlock your door from anywhere, add or remove access codes, and get alerts when a code is entered, all from one spot – the Ring App. You can also check your lock’s battery level via the Ring App. Ring Alarm, with its Z-Wave ecosystem and cloud-based app, is currently compatible with a range of in-home devices taking home security customization to another level. Including the Schlage Connect, you can also pair your Ring Alarm Base Station with compatible carbon dioxide and smoke detectors, flood and freeze censors, and motion and contact censors. If you’re looking for the added convenience of voice activation, Ring also works with Amazon Alexa. Now you can simply ask Alexa if your door is locked, or ask her to lock or unlock it for you. The possibilities of a secure smart home are growing rapidly, but don’t let this intimidate you. Adding these security capabilities to your home is simple, especially with Schlage’s easy installation. 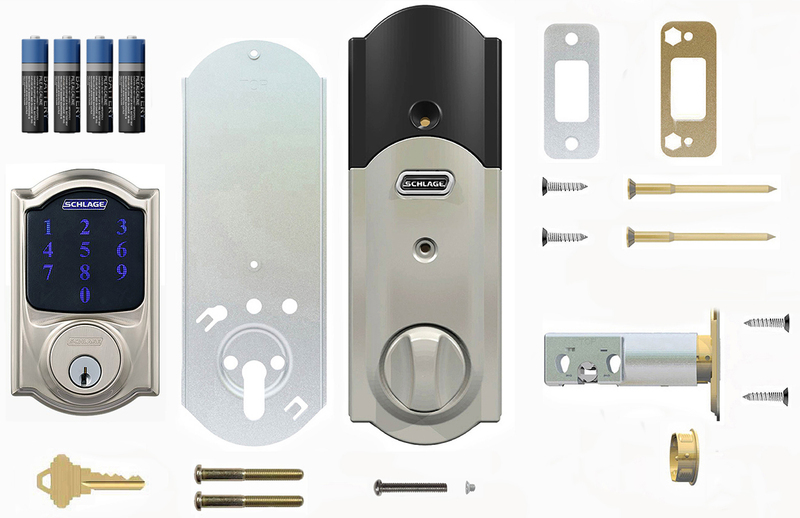 Schlage smart locks are designed to fit standard doors without the need to drill additional holes and can be installed with just a screwdriver. Because they’re battery operated, there’s also no need for wiring or to call an electrician. Setup is just as convenient with quick and easy system synchronization between the Schlage Connect smart deadbolt and your Ring Alarm. Simply follow the instructions in the Ring App to pair your devices. Do you already have a Z-Wave-compatible Schlage Connect smart lock and want to add it to a new Ring Alarm? Do you already have a Ring Alarm system and are interested in adding a smart lock to improve the security of your home? Maybe you’re starting your DIY project from scratch and are looking to add both? Visit our product pages to learn more about the Schlage Connect™ Smart Deadbolt and find a retailer near you. While Schlage Connect Z-Wave and Z-Wave Plus are popular choices to pair with Ring Alarm, any of our Z-Wave-connected products will work with the home security system. This includes Schlage keypad levers, which also make a great option for the entryway from your garage to your house, extending your Ring of Security even further. Learn more about these and other Schlage smart locks at Schlage.com. Smart home automation is going to be bigger than ever in 2019. Take a look at the number one driver behind smart home tech and where the industry is headed. Smart home automation is going to be bigger than ever in 2019. According to the Consumer Technology Association, which sponsors the Consumer Electronics Show (CES), and exhibitor Microsoft, there will be 30 billion connected devices by 2020, with the smart home market alone approaching $40 billion in total sales. The number one driver behind the adoption of smart home tech? It’s still home security, and according to a recent survey by CNET and Coldwell Banker, that trend is expected to continue into 2019 and beyond. That’s where Schlage and its innovative smart lock technology is expected to play a bigger role than ever with new adopters as well as Schlage’s 40 million current customers. Schlage’s role: create smart locks that provide security, convenience and smartphone control and monitoring while seamlessly enhancing the beauty and style of a home. Technology showcases like CES and a seemingly endless stream of articles in today’s tech and home décor magazines paint a picture of just how important home automation is becoming – and how useful and valuable it is for homeowners. Schlage has established itself as a leading brand in home automation security with connected products such as the Schlage Sense™ Smart Deadbolt and the Schlage Connect™ Smart Deadbolt. These Schlage smart locks were featured at CES 2018 and were invited to join other smart home technology leaders on the road, coast to coast, with Amazon’s Smart Life Roadshow. Bringing convenience to a variety of lifestyles, Schlage offers smart locks designed with the latest Bluetooth®, WiFi, Z-Wave, or Zigbee technologies that pair seamlessly with a wide range of home automation systems. Added compatibility with hands-free voice assistants like Amazon Alexa and Google Assistant makes it easy to build a customized smart home experience. For Schlage, the best is yet to come. Building on a heritage of innovation that began in 1909 with a patent for a door lock that could turn a home’s lights on and off, Schlage is looking to take door hardware – and the smart lock – even farther in 2019 and beyond. Stay tuned as Schlage once again raises the bar in home automation. New products, new platforms, new voice-control innovations - that’s just a taste of what’s in store with Schlage and an entire array of innovative home automation technology partnerships. Easy-to-install Schlage smart locks pair simplicity and security. If you’re considering a smart lock for yourself or a loved one this holiday season, let the simplicity of Schlage be your guide. Whether you’re a pro at lock installation or new to DIY, have a fully equipped home automation system or are just getting into smart home technology, installing a smart lock is simple and takes just minutes. We’re here to put you at ease about adding this new level of security to your home. You’ll find easy installation no matter which electronic or smart lock you choose - Schlage Keypad Deadbolt, Schlage Touch™ Keyless Touchscreen Deadbolt, Schlage Sense™ Smart Deadbolt or Schlage Connect™ Smart Deadbolt. If you’re not sure which lock is right for you, try our Get Help Deciding tool. Do I need to do wiring? Won’t I need an electrician? No. Schlage electronic locks are battery operated. You’ll simply route the lock’s existing wiring through the bore hole in your door to connect the exterior keypad or touchscreen with the interior thumbturn , install the batteries and you’re connected. Will I need a lot of tools? All you need for installation is a Phillips head screwdriver and a measuring tape or ruler to prepare your door before installation. Find more pre-installation tips at Schlage.com. How much assembly is actually required? And of course, you’ll also get Installation Instructions or Quick Start Guide to take you through the installation steps. These guides are also available in Spanish. What if I do get lost during installation? Our How-To Center offers installation videos for each of our electronic and smart locks. There are also step-by-step, interactive instructions online for the Schlage Connect™ Smart Deadbolt and the Schlage Sense™ Smart Deadbolt. The Schlage Sense app has interactive instructions as well. Our FAQ pages also share tons of tips for getting your lock in perfect working order. How will I know if I installed my lock correctly? The installation instructions will walk you through testing your electronic smart lock. Additionally, our how-to videos and FAQs offer suggestions for correcting common missteps, giving you confidence that you and your home will be protected. We’ve designed our smart locks to make your life not only safer but also simpler, even during the hustle and bustle of the holiday season. There’s no debate over the purpose of a good door lock – it keeps your home, you, your family, and your belongs secure. We believe convenience should be an equally standard feature. That’s why we’ve designed our smart locks to make your life not only safer but also simpler, even during the hustle and bustle of the holiday season. The Schlage Connect™ Smart Deadbolt and Schlage Sense™ Smart Deadbolt both hold 30 unique access codes, and the Schlage Touch™ Keyless Touchscreen Deadbolt holds up to 19. Give holiday guests their own code during their visit, then deactivate the code when they leave. They’ll appreciate the freedom to come and go with ease, and you’ll love the continued security. You can also assign codes to cleaners, handymen or other service providers helping to prepare the house for the holidays. Don’t forget the pet sitter keeping an eye on Fluffy when you’re traveling. You can schedule your codes to be recurring, temporary, or one-time-only, depending on your needs. With these convenient access codes, why carry keys with you or hide one under a fake rock, which isn’t secure anyway? No keys means you won’t lose them when making snow angels with the kids, taking a walk with the dog or going for a run to combat those holiday calories. Lock or unlock your door from anywhere. If guests arrive at inconvenient times, like when you’re still at work, you won’t have to leave them standing out in the cold. Simply use your smartphone to unlock your door and let them in. You can also check the status of your lock from anywhere, perfect for those cold nights when you want to make sure the door is secure but don’t want to leave the warm comfort of bed. Why not use an app to give access to a neighbor dropping off your mail while you’re on vacation, too? When you match your lock with a smart home automation system, you can often create routines that control multiple devices with a single push of a button. For example, make a “Welcome Home” routine so that when you unlock your door, the entryway lights come on, the thermostat adjusts and holiday music begins to play. Different locks are compatible with different technology. Try our Get Help Deciding Tool or find more tips online to find what’s right for you. Fight porch pirates by protecting deliveries during holidays. In addition to the remote access that comes with all our smart locks, Amazon Key and Prime users in select areas have the additional option of using in-home delivery. This allows delivery people to place packages inside your front door without providing them with an access code. You can also restrict access during certain times of the day if needed. Schlage door hardware comes in a variety of finishes and styles to help any porch make a great first impression. Function is equally important, though. Touchscreens can be used even when they get wet from rain or snow, or when you have gloves on. Numbers on the touchscreens are also backlit, making it easy for you and your guests to see them as the winter nights get longer. Make your holidays, and every day, easier with the convenience of a Schlage smart lock. Enter the Season of Change sweepstakes for a chance to win a $2,000 VISA gift card and a Schlage Connect™ Smart Deadbolt with Amazon Cloud Cam today! In the meantime, you can find more holiday inspiration by following us on Instagram or Facebook. Find more holiday style inspiration when you follow us on Instagram and Pinterest.